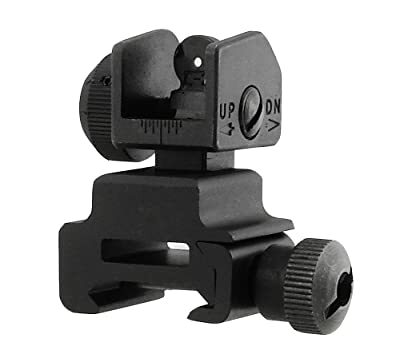 So far, there isn’t anything that can serve as perfect backups for gun scopes other than the best flip up sights for AR 15 especially if your optics are not that reliable. 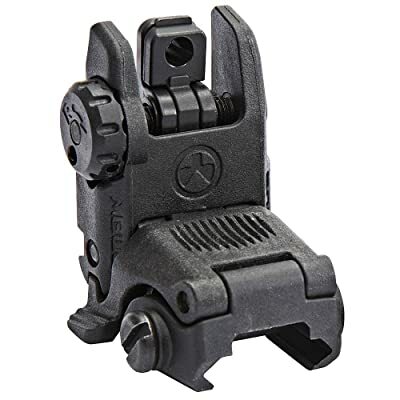 Also known as “flippable backup iron sights”, the flip up sights can serve as our reliable base sights when it comes to shooting close to long range targets without the need for adjustments. The AR 15 can be your reliable self defense weapon, your target shooting firearm and of course your reliable hunting tool. But if you think that an iron sight could serve you better than optical scopes on certain situations, then having a reserve flip up sights is not a bad idea. The best advantage that flip up sights provide is their versatility. They are very easy to install, don’t take the place of the optics and if you don’t need them you just flip them down and you’re rifle is cleared of an obstruction. And because they generally are made of metal or durable polymer, they are the rough riders for any rifles but always offer reliable and accurate shooting. There are many flip up sights that an AR 15 can handle but only few of them can really match the AR 15’s compact size, potentials and be a perfect fit to the AR 15’s flat top rail. In this case, choosing the best flip up sights for AR 15 could be a big challenge. This is why we have set some standards to help you choose the best. If you do not intend to use much of the optics, the fixed type sight could serve you well. These are not flippable, no moving parts and always ready for your aim. However, they can get in the way of the optics if you want to mount one. The folding types are more flexible, flippable and some varieties even have adjustable center sights. The best flip up sights are those that cannot be easily damaged by rough use so construction should be a priority. Common materials for these are aluminum, steel and polymer or sometimes a combination of these. Steel is seen to be the strongest material but aluminum is lighter and rustproof. Polymer flip up sights are also lighter but these are not as durable as the steel and aluminum made sights but cheaper. The aperture sight is actually the peephole of a sight and this is very important because this can make or break your accuracy with your rifle. If your goal is to use your AR15 for short range shooting and for quick target acquisition, a sight with bigger aperture could be ideal. Smaller aperture, on the other hand, is best for long range shooting because it’s already zeroed in right on target through its small hole area. If you have poor eyesight especially on low light conditions, then you may consider having the best flip up sights for AR15 equipped with a sight visibility mechanism. And by this, the example we can give is the tritium. These are small vials that gather light during the day and glows in the dark during low light conditions. Basically, it can help you focus on your target with illuminated light right on the aperture. Now we take you to the greatest selection of flip up sights that have been proven to be accurate, efficient and popular among AR 15 shooters. The American made Magpul Backup Sight (MBUS) can be your best flip up sight because it is designed for rougher use that it could fit as a military style iron sight. Made of polymer, it has an adjustable windage and offers two different sized apertures. Very light, impact resistant but lightweight, it also has an adjustable knob for windage and can fit into many types of Picatinny rail hand guards. Installing it is also very easy and because it is resistant against scratches and brunt, this can be your reliable flippable sight that you won’t worry having on your AR 15 rifle anytime. Very simple design, this comes at very affordable price as well. And for a backup sight, we can say you can get your money’s worth with it. Made of strong polymer that ensures durability. Lightweight, easy to install and use. Featured with a back knob for windage adjustment. Very versatile it fits most 1913 Picatinny railed hand guards. Resistant against scratches and impact. Not as strong as steel iron sights. ark earth color and black. However, the most recognizable feature of these sights is their micro size that is almost 1.5 inches long. With two combined, one near the barrel and the other on the top rail, they only add up about 3 ounces weight to your rifle. You will see that once you put these sights on, they stay locked very tight in place. You can also quickly remove them thanks to their quick-release spring action system. They can also be clamped to any Picatinny rail and get secured using flat head screwdriver. 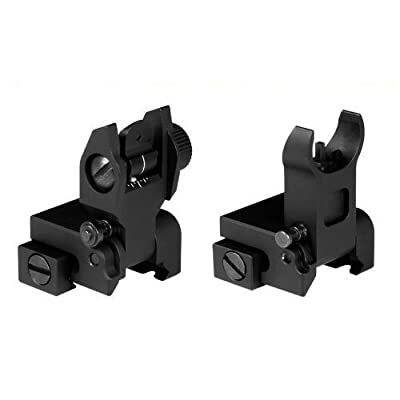 Considered as one of the best flip up sights for AR 15, these are obviously impact resistant while it offers double target acquisition accuracy because of the two sights combined. Made of super durable materials – stainless steel and aluminum combined. Featured with a barrel and rear sight for double targeting accuracy. Only 1.5 inch long that can enable optics to be mounted once these are flipped down. Impact resistant and lock securely in place by means of its detent balls. Designed for firearms with top raised rails. Rear sight aperture may seem quite large for some users. One feature that this product has is its dual aiming aperture that offers shooters to adjust the distance range when it comes to different shooting ranges. This UTG sight is very versatile it has a knob for windage adjustment. It is also featured with a Posi-lock that you can quickly secure the sight with its locking thumb nut in an instant. And once the sight is locked on, you now have to choose which aperture to use. With windage adjustment, all you have to do is just shoot better but more accurate at your target. Another great aspect of this sight is its Picatinny mounting deck that makes it compatible with any flat top rifle. Aside from that, this is made of very durable aluminum so this will surely last many uses even with rugged use. Made of tough aluminum construction. With dual aiming aperture that makes its flip up sight very versatile to a wide range of shooting options. With adjustable windage knob for a more accurate estimation on targets. Featured with a Posi-lock to prevent tipping and slipping and also for quick installation. With an integrated Picatinny mounting deck for compatibility with any weapon with flat top upper receiver. A bit larger than common iron sights and can be a negative feature for those who are used on using micro iron sights. This Diamondhead sight is no other. First it comes with two sights – one for the front and the other for the rear and both of them are compatible with all modern sporting rifles including the AR 15. Next is that both sights are integrated with diamond-shaped apertures (patented) for a more unique sighting system. Each sight also has NiteBrite photo luminescent inserts to help you focus on your target even on low light conditions. Both luminescent inserts can also be charged using light from flashlight or from natural light. 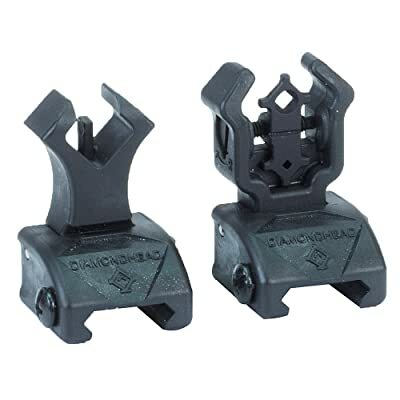 Constructed with polymer materials, these sights were tested for durability and precision aside from these are lightweight and can be secured firmly on all rifle tops with Picatinny rails. Comes in one set of two – front and rear sight. With patented diamond shaped apertures. Each sight is integrated with NiteBrite inserts that can illuminate apertures during low light conditions. NiteBrite luminescence can be charged with natural light or with a flashlight. Made of advanced polymer composite material for durability, strength and to make it lighter. Compatible to all the 1913 Picatinny rails. Spring loaded for instant flipping with just one button push. With upper housing for faster and better alignment. Some users are not comfortable with the rear sight which a bit narrow. Talking about the best flip up sights for AR 15 for the best material, these sights are made of aircraft grade aluminum metal. And with diamond shaped windage adjustable apertures, your target can be easier to acquire. On the other hand, the front sight also has elevation adjustment to calculate bullet drop during long range shooting. Both sights are precision calibrated and they are made to be a perfect pair so that maximum accuracy can be attained. 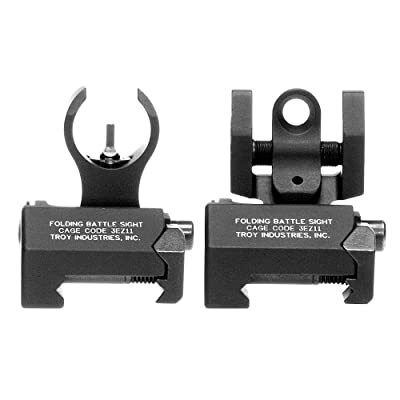 If you are into mounting all metal accessories to your AR 15 especially the flip up sights, these pair should suit you up. In terms of construction, price range and precision, these sights from Green Blob should be worthy of your purchase. Comes in two sights – front and rear sight. Made of aircraft grade aluminum material that’s unbeatable among flip up sights. Easy to install and zero in. Very well built and smooth. With diamond aperture for easy acquire target. Featured with windage adjustment aperture. Compatible with any Picatinny and Weaver rails flattop rifle. Lock is not always reliable. Having the best flip up sights for AR 15 can really provide you more security with your rifle even with or without your riflescope. In fact, a lot of hunters opt to use flippable iron sights when it comes to hunting game that are more agile and wilder. A flippable iron sight offers an instant precision to your rifle without the need for complex adjustments. And if you want to put on your scope, they won’t get in the way but will serve as backup when you need to take your scope out due to bad weather or during intense hunting activities. These 5 best flip up sights can do you a great benefit with your rifle’s precision and accuracy. However, if I only have to pick one, I would like to have the Magpul Gen 2 MBUS. For the reason that it’s American made, very basic but I am ensure of its quality and efficiency. Although it is not actually made of steel or aluminum, it is still made of impact resistant polymer while its dual sighting option offers a great lead when it comes to hunting on different hunting ranges.